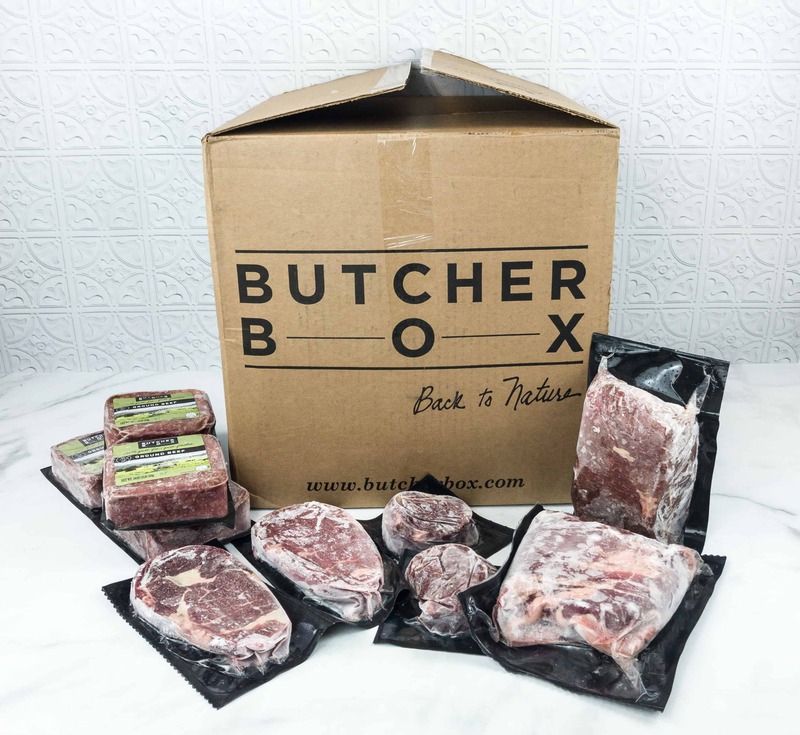 Butcher Box is a subscription box service that delivers premium quality meat for $129 per month. Each box comes with a selection of meat (about 15-20 meals worth) that has been carefully cut and prepared. 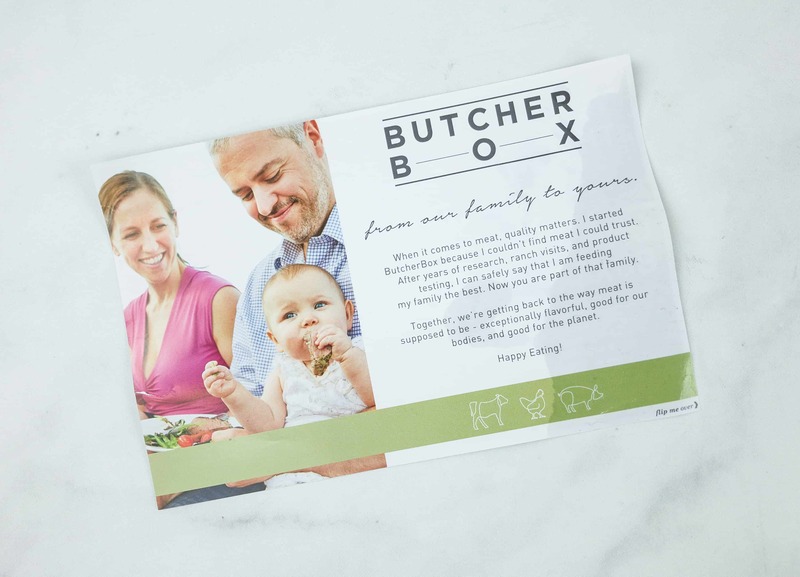 The Butcher Box brings back that unique experience you get when you visit your local butcher shop. 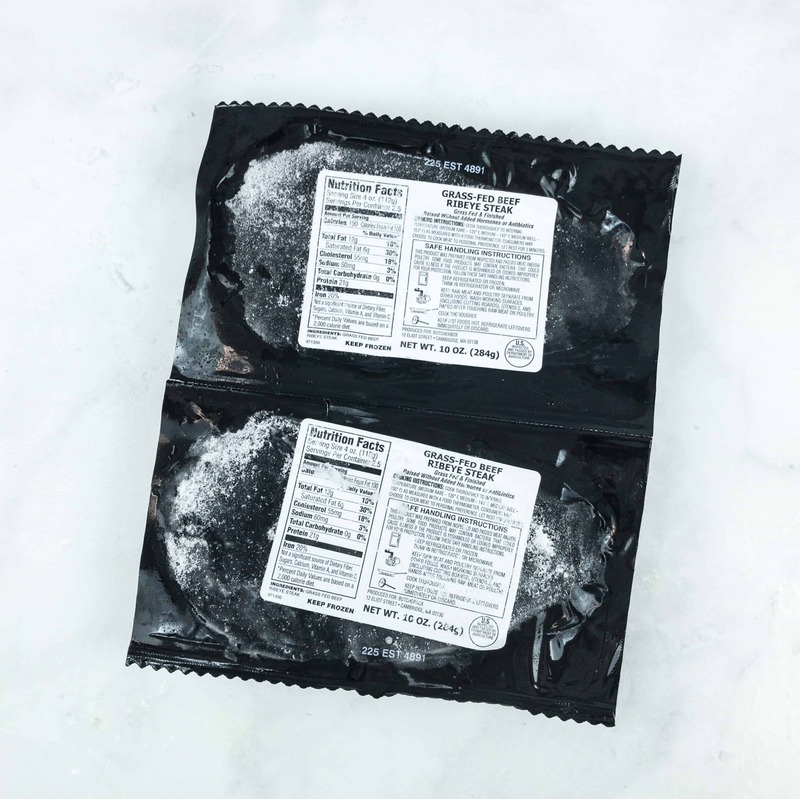 Their specialty is 100% grass-fed beef, but they also provided mixed subscription options that include heritage pork and organic chicken. You can also have the box delivered every two or three months depending on your needs. 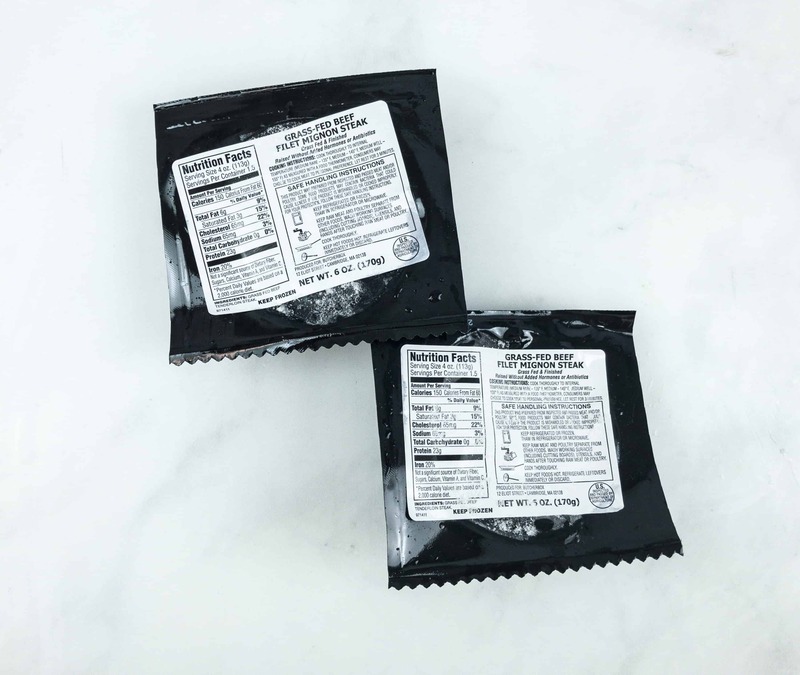 The outer packaging is earth-friendly. 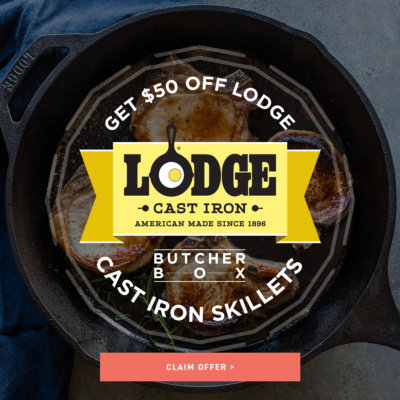 DEAL: Check out the current ButcherBox deal – just use this link to sign up! 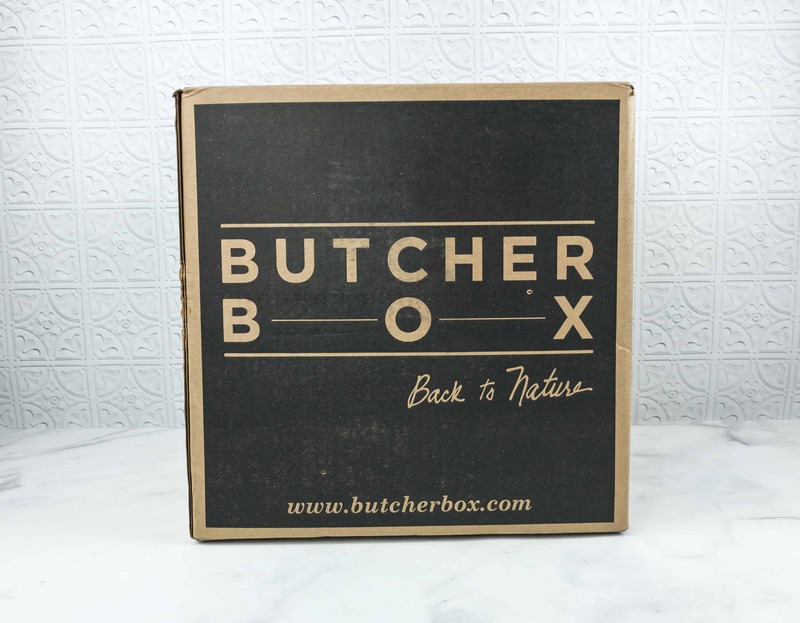 ButcherBox is giving away FREE BACON FOR LIFE* – their biggest promo ever! No coupon needed – just use this link to activate the offer! Valid until 11/30. 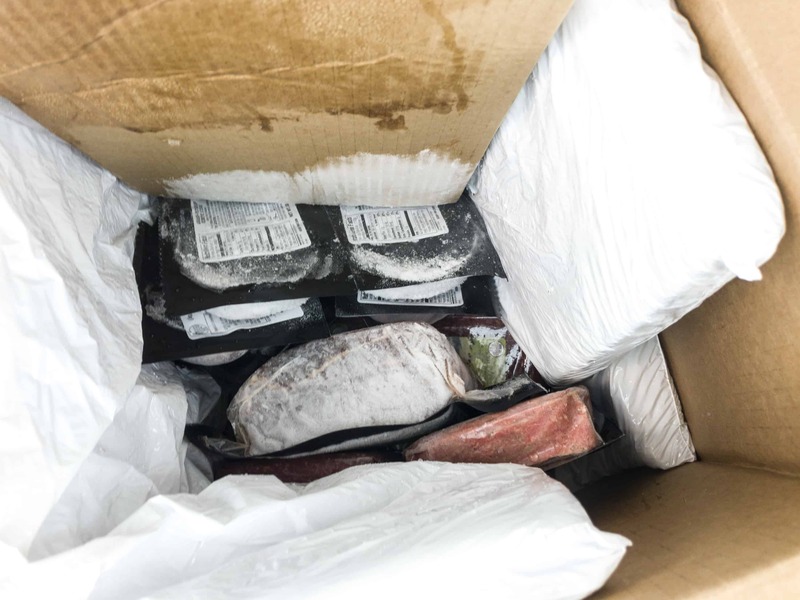 The meat is vacuum sealed in plastic, packed in an insulated bag, and then kept frozen within the outer soft-side cooler padding and box with a large dry ice pack. 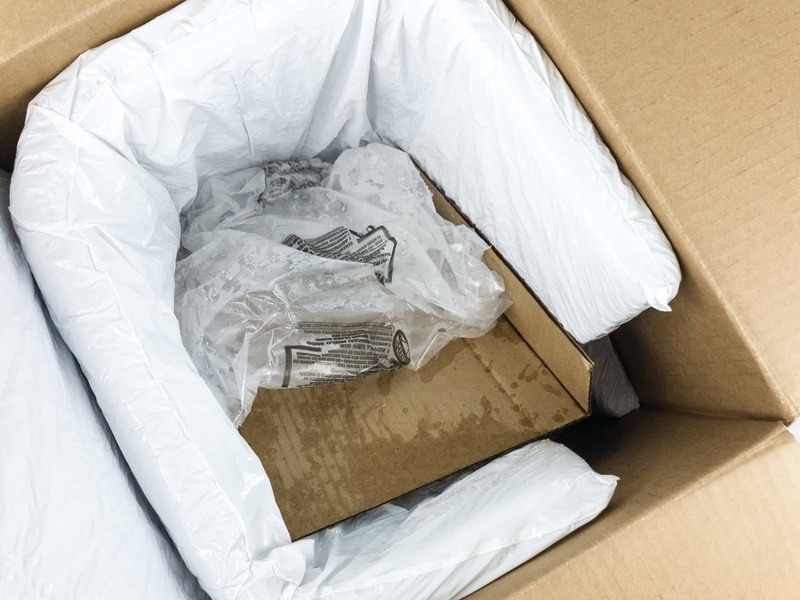 We’ve always had everything arrive rock-solid, so there have been no issues with temperature control during shipping. The meat arrives ready to throw in the freezer or thaw for use. 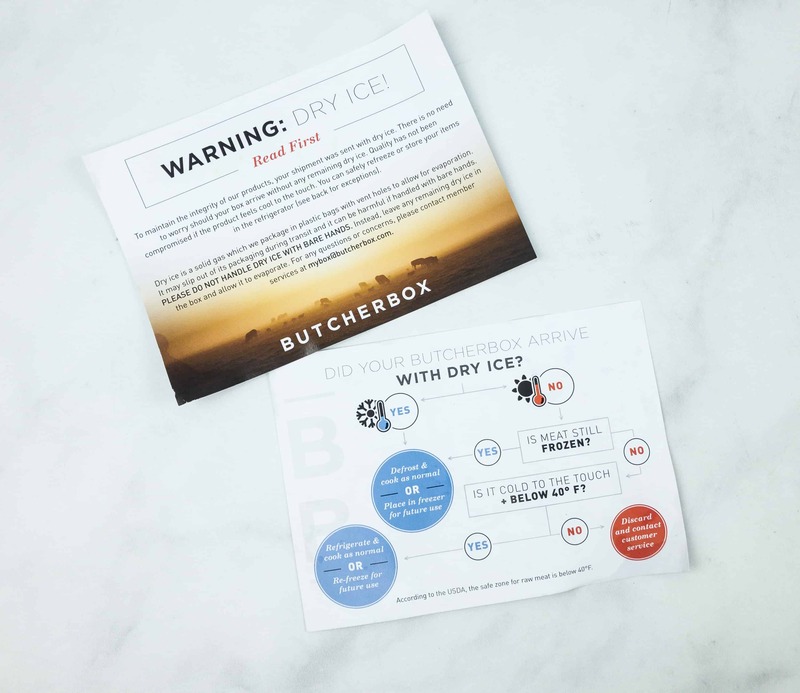 They included info cards with tips on how to safely handle the dry ice. They also include a reassuring chart to reference, in case your dry ice has evaporated. 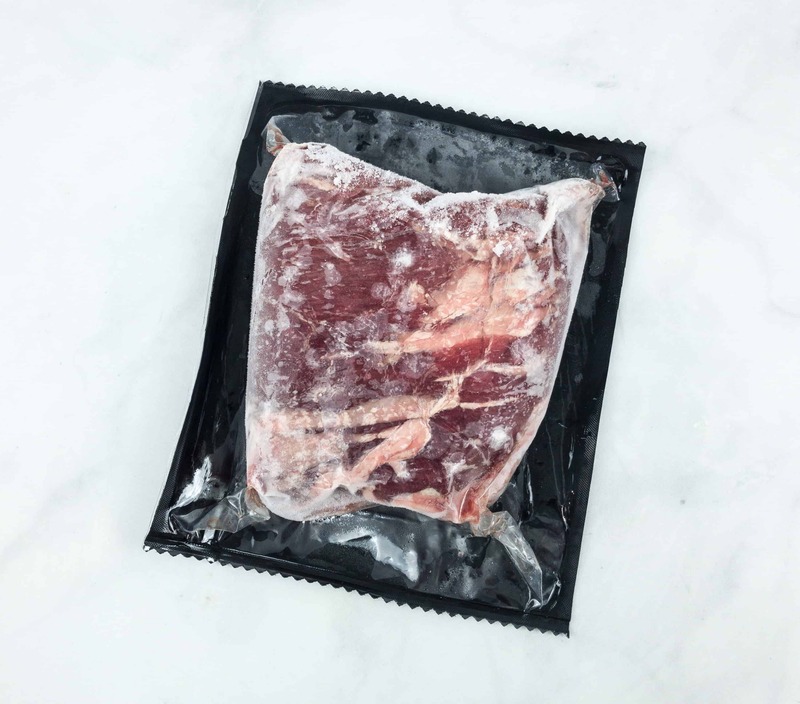 Your meat is fine, as long as it is refrigerator temperature or below. It can even be refrozen, though ours has always been completely frozen upon arrival. The box also includes a note from Butcher Box. 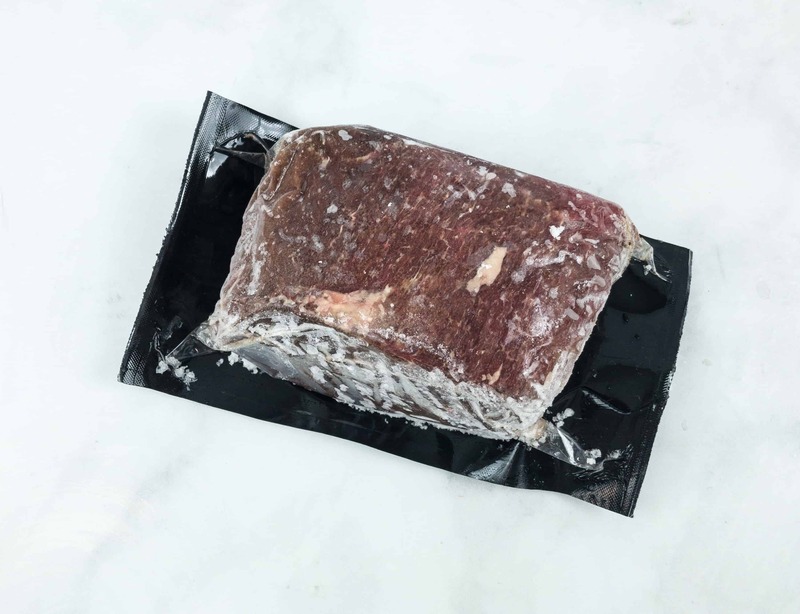 The back of the card has more tips on thawing and prepping your meat. The packing list always cracks me up, because they list things like the cardboard separator along side all of your meats! 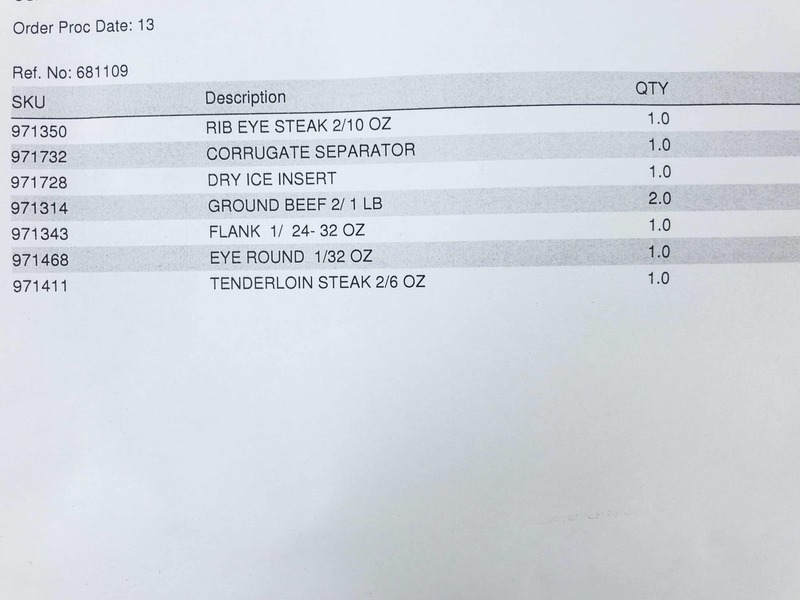 All the delicious cuts of beef included in this month’s Butcher Box! We get the beef box. Everything is portioned to a manageable size, so you can pull it from the freezer as needed without thawing more than you want. There are a couple of big roasts, but everything else is portioned smaller. Grass-Fed Beef Ribeye Steak. The ribeye is the king of steaks, cut from the center of the rib section. It has a smooth rich texture and a very pronounced beefy flavor. These have great marbling, though it is pretty fine because of the relative leanness of grass-fed beef. In fact, the grass-fed leanness makes this is a really great cut even for people who normally find ribeye to be too fatty. 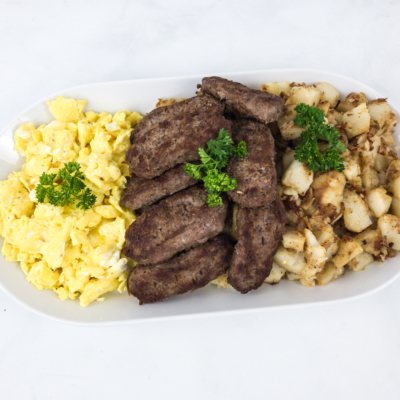 Because it is a full-flavor cut, it is also great for those unaccustomed to grass-fed beef. It comes in two 10 oz packs. 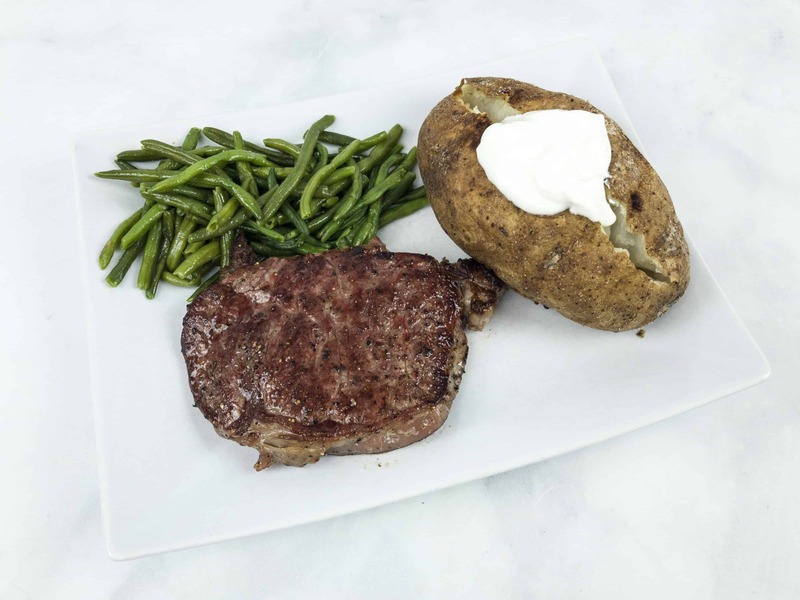 These grass-fed steaks are fairly lean and the bands of fat are adequate enough to provide the big, greasy rib-eye flavor, but there isn’t much waste once cooked. This meat is so easy to cook. The beef is really flavorful, so it doesn’t need much in the way of seasoning or sauces. Since it was rainy and windy, I skipped the grill and just cooked this on the stove. A quick sear on each side followed by a few minutes in the oven did the trick. The steak cooked up nice and juicy, as the protective band of fat around this cut prevented it from drying out. The beef is so tender and juicy! 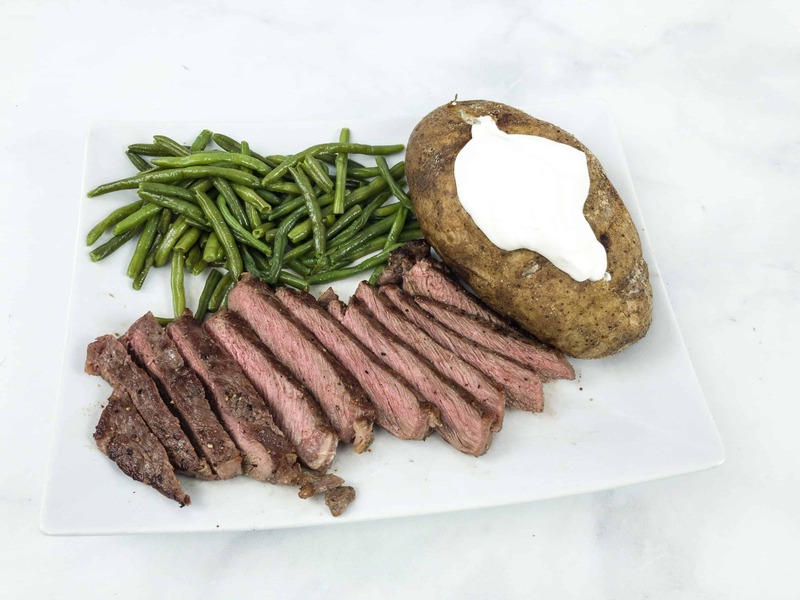 We paired it with a baked potato and simple green beans for an easy, steakhouse-style meal. The meat slices easily, and it’s both firm and tender. The only odd part about the cuts is trying to slice them across the grain. The grain of the meat usually seems to run diagonal to the plane of the steak. Here, I obviously guessed wrong and ended up cutting with the grain. It was still very tender. Grass-Fed Beef Filet Mignon Steak. It’s a small cut from the smaller end of the tenderloin muscle, producing the most tender meat of any cut! 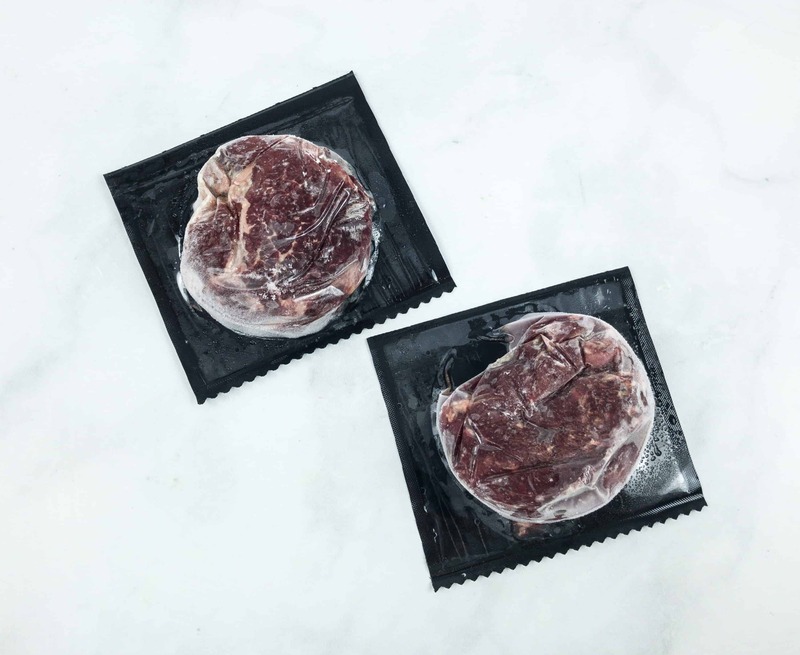 Each pack contains 170 grams of pure hand trimmed delicate filet. It’s so tender that it can be cut with a basic table knife. Once these are cooked, there is virtually no waste at all. 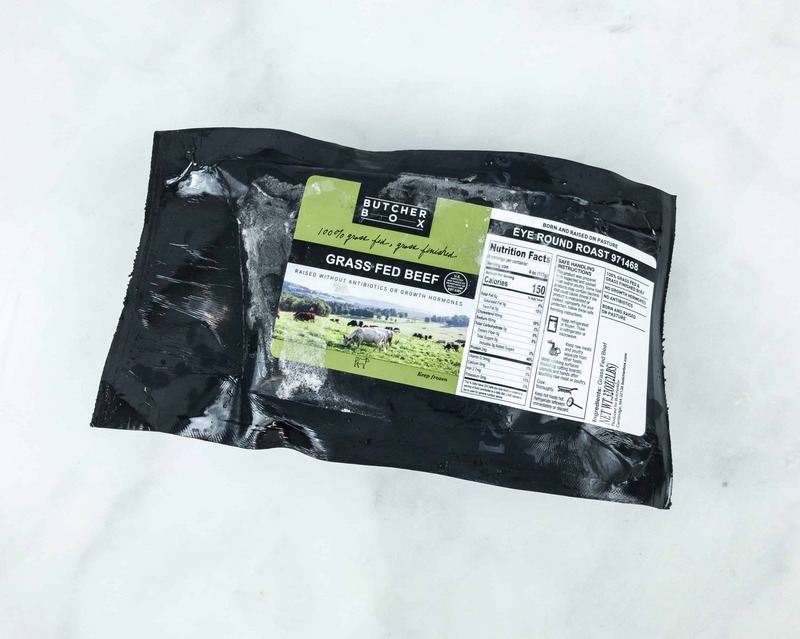 Grass-Fed Ground Beef. 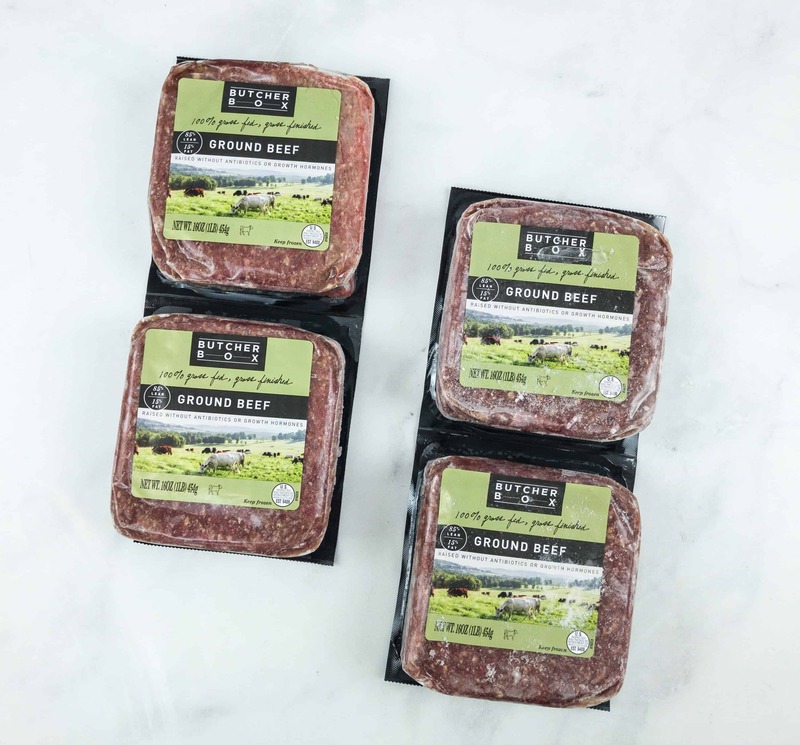 This month, we received four packs of frozen solid ground beef. It’s the ideal meat to use as a patty for a burger because of its juiciness and meatiness. 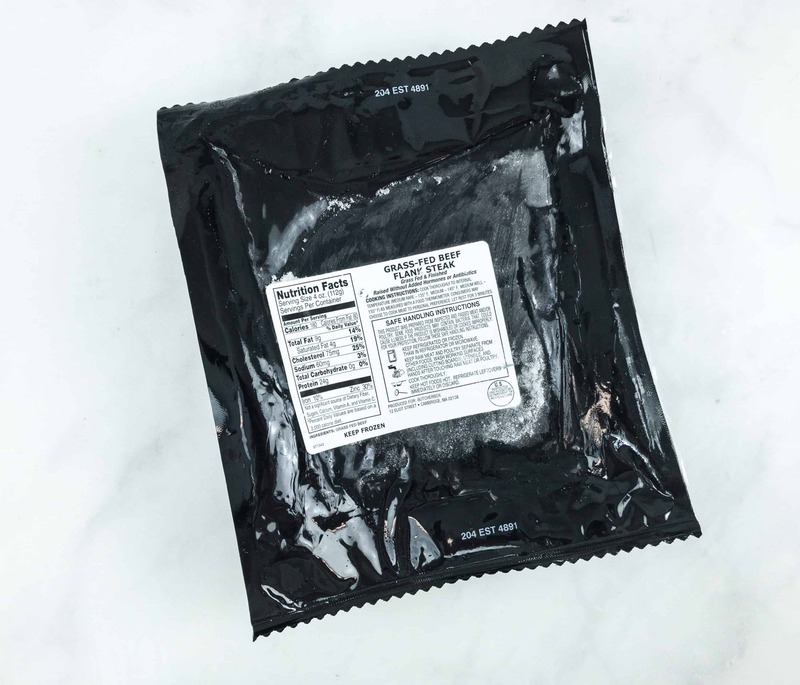 This ground beef is made from 85% lean and 15% fat, perfect for burgers and other general use. The beef produces a little liquid when cooked, and it doesn’t flare up much when cooked on the grill. It makes a very juicy and flavorful burger, but it doesn’t seem fatty at all. Eye Round Roast. It’s a boneless roast that looks like tenderloin, but you’ll want slow heat for this one, as it would make for a tough steak! Since the meat was hailed from a lean and active muscle, it contains less fat and produces a ton of flavor. 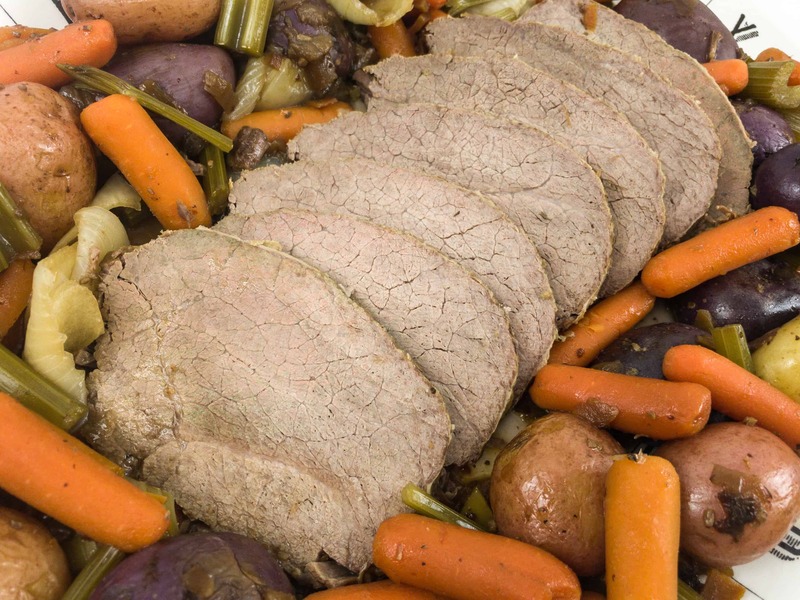 Cooking it is so easy, You can prepare it as an oven roast, or, as here, as a pot roast. I threw it into the Instant Pot, still mostly frozen, with some mushroom and Merlot simmer sauce. It only took 50 minutes, with another 10 minutes once I tossed in some baby carrots, new potatoes, celery, and onion. Compared to other parts of the beef, it is less juicy but is definitely more meaty and flavorful. It has great integrity, holding together vey well, even in a pressure cooker. 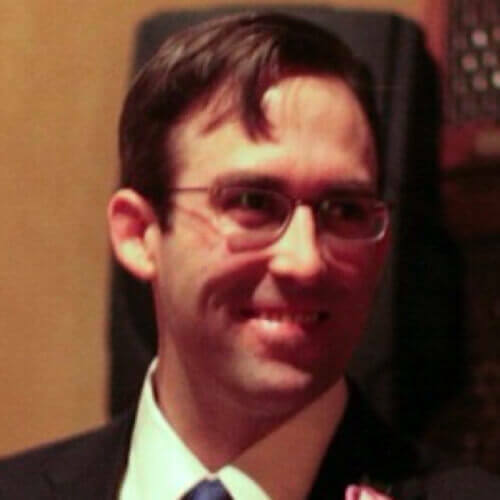 It seems really firm at first, but it loosens up once it rest, and it actually is pretty tender. 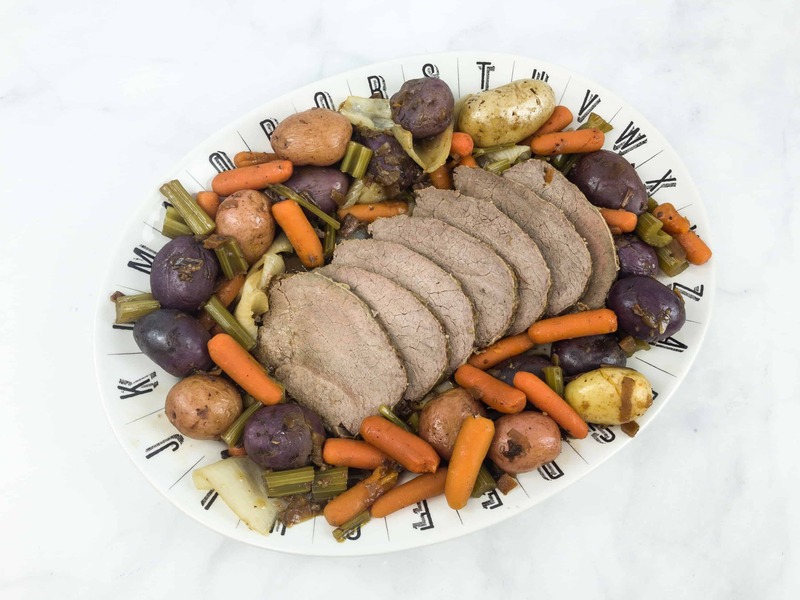 It makes a very lean pot roast, a dish that is ofter as much fat as meat! Grass-Fed Beef Flank Steak. 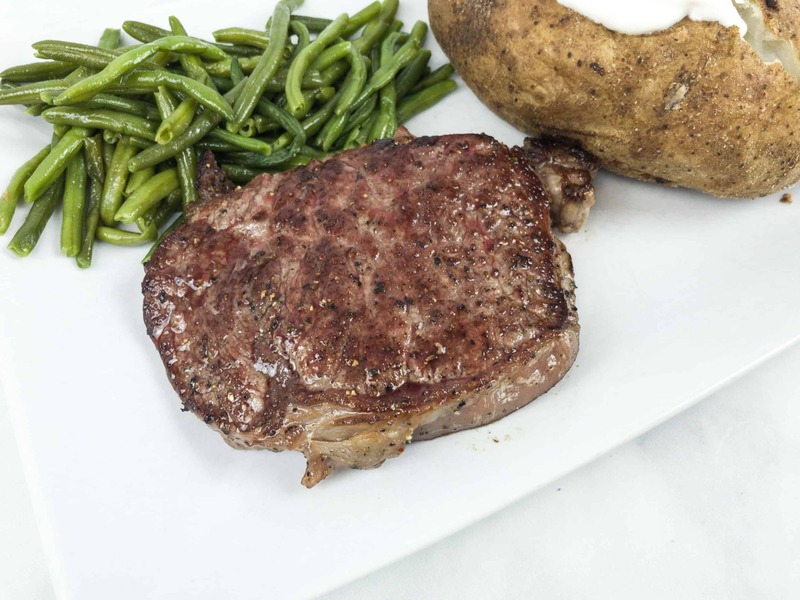 This steak comes from the flank, located just behind the plate and below the loin. It’s a large flat steak, with a very distinct grain running crossways. 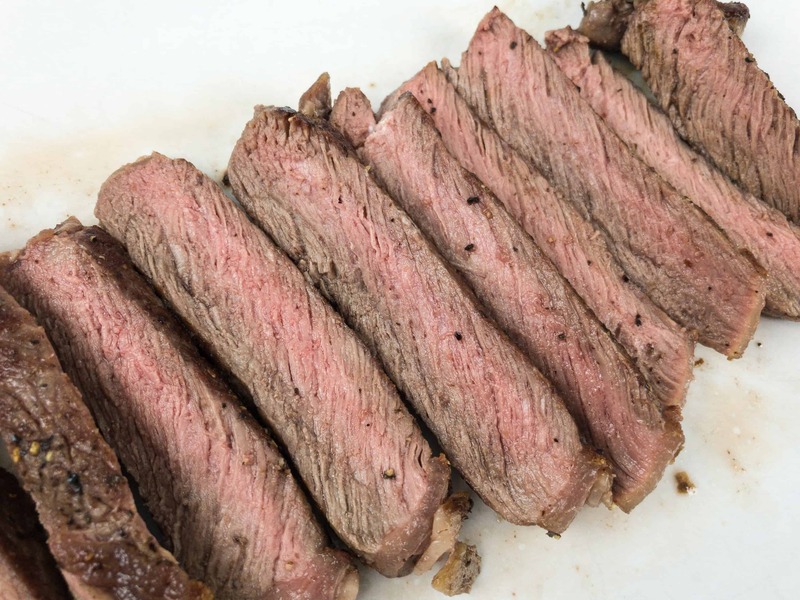 This flank steak is so easy to cook, and it’s ideally marinated, grilled, and sliced thin. It is definitely one of the most popular choices for steak sandwiches or for serving over a fresh salad in buffets and parties. I tend to like it for grilling and using for fajitas or served with a chimichurri. Butcher Box is quite a pricey subscription, since what we are paying is the quality of the meat they are providing. 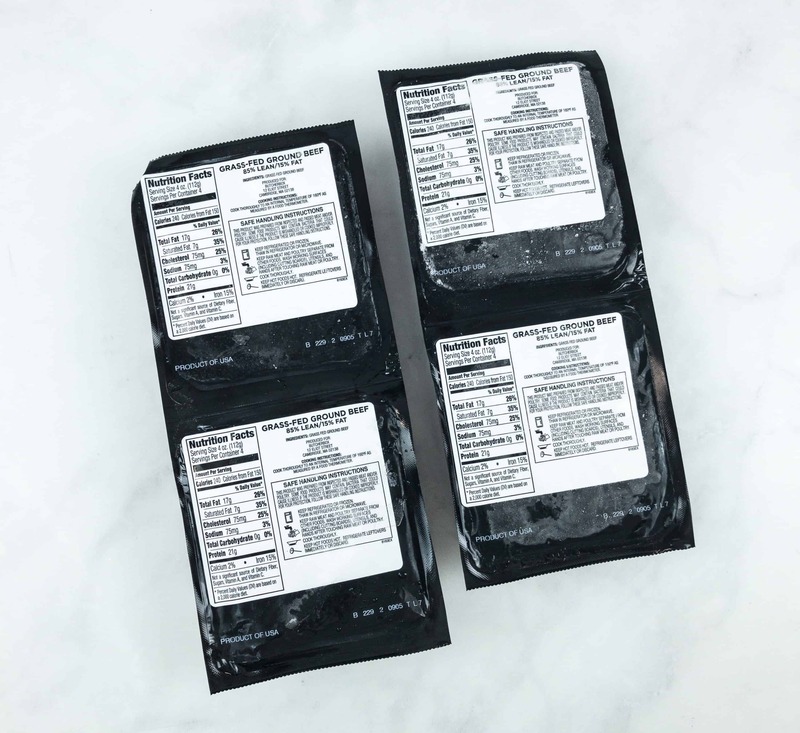 Each box contains 7 – 10 lbs of meat, which is enough for around 20 individual meals (at a 5 – 8 oz portion size), that works out to about $6.50 per portion for the meat – and there is no difference in cost between getting all grass-fed beef or mixing your box to include organic chicken and heritage pork. We usually get the beef box, and we really enjoy it. The meat is very lean, and there is almost zero waste once cooked — nearly all the fat is marbling or trimmed well enough to be enjoyable. 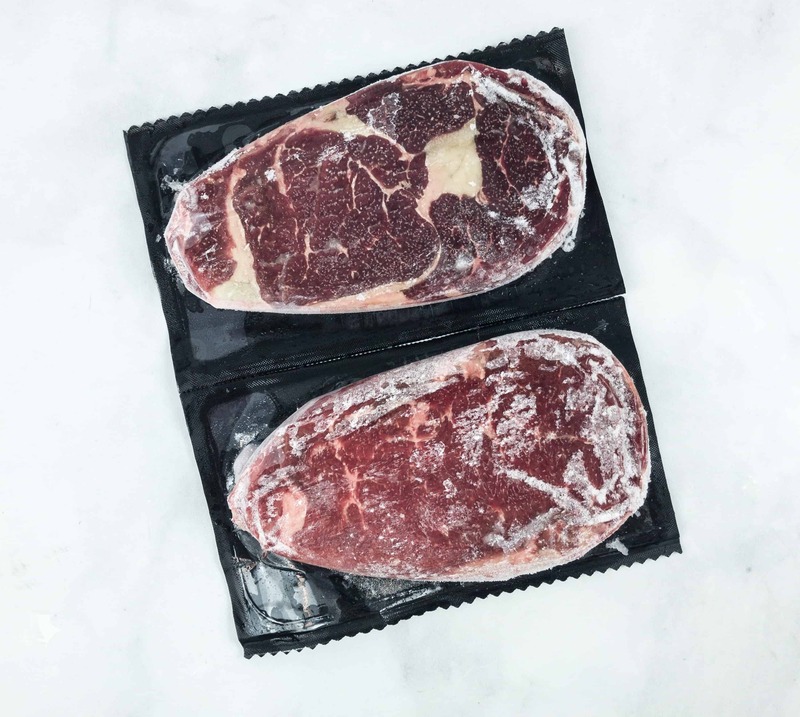 All the meat arrived in deep freeze and was cut into manageable sizes, so it’s easy to portion out over time, making it a good medium-term investment in protein. You can treat yourself to steak night once a week and think of it as a lifestyle enhancement instead of a one-time splurge. I like having some in my freezer for an easy meal. You can cook the steaks from frozen, and the bigger cuts work well in a slow-cooker, pressure-cooker, or Instant Pot. Just cook some veggies and grab a starch, and you have a completer meal, usually with enough left over for lunch the next day. 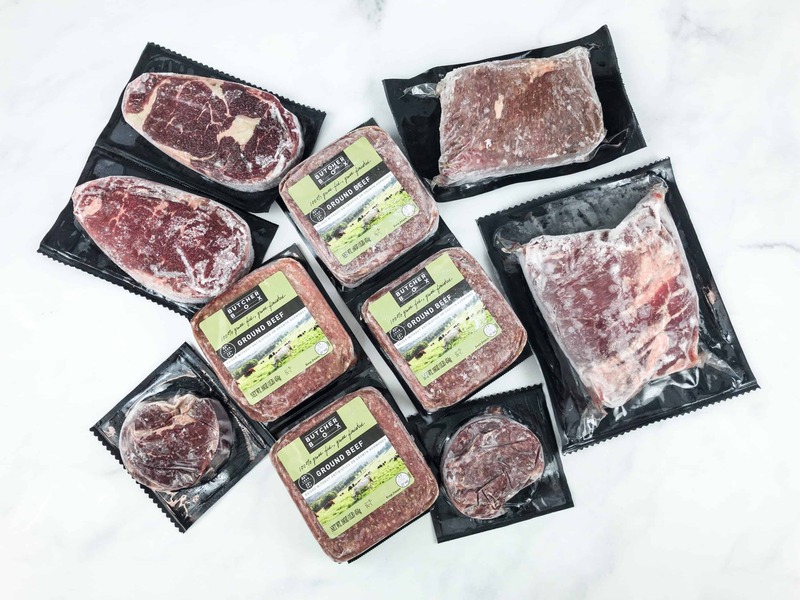 What did you think of our haul of grass-fed beef from Butcher Box? 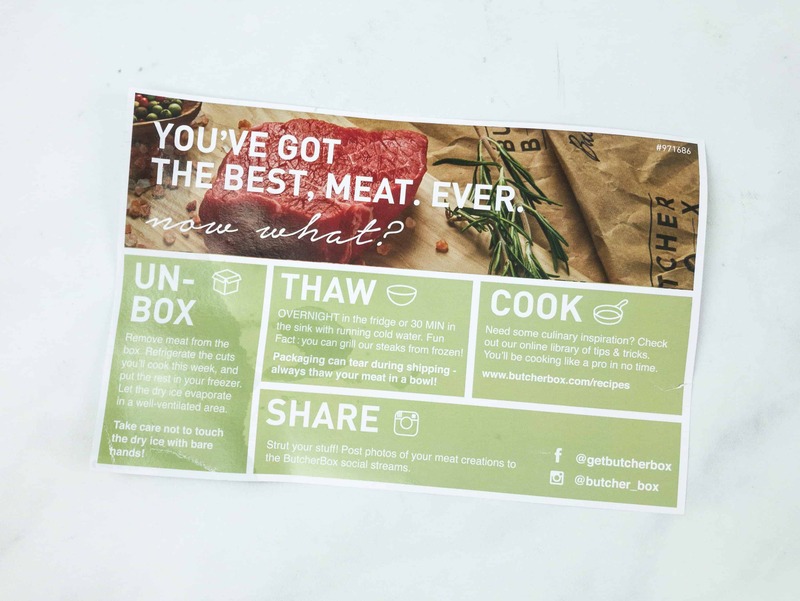 Visit Butcher Box to subscribe or find out more!